Peter Pan at Cardiff's New Theatre is a fabulously traditional panto. J.M.Barrie's original work has been helpfully truncated (no Mr and Mrs Darling in this gig, though the canine Nana has been reprieved) and the fun and games kick off with the eponymous Peter flying in to the Darling nursery. Pixie dust duly sprinkled, Peter Pan is leading the kids across the skies to Neverland. Matthew Chase puts in a sweetly assured turn as Peter, though the production is heavy on young women in the featured supporting roles - Emma Prosser's Tinker Bell, Julie Cullen's Wendy, Natalie Winsor's Tiger Lily and last year's The Voice performer Stephanie Webber as Mimi The Mermaid all vie for Peter's attention. The four are a delight in the story's telling, however they make for just a hint of eye-candy sexism in this Cardiff narrative that marks a distinctive contrast from London's more metro-sexual offerings. Likewise, the banter in Wales is nothing stronger than knocking local city rivals Swansea and Newport. There's not a reference to Trump or Brexit to be found and you know what? In this most turbulent of years, it actually makes for a refreshing change to enjoy a politics-free panto. Mike Doyle's dame, Mrs Smee, is a polished delight. A local talent, Doyle's masterful comic presence is a saucy treat that keeps just to the right side of acceptability. His gags are as corny as they come but he works the crowd wonderfully - and as a big feller, spoofing himself as a Bond movie title-song singer named Burley Chassis (another local hero, think about it) truly tickled. 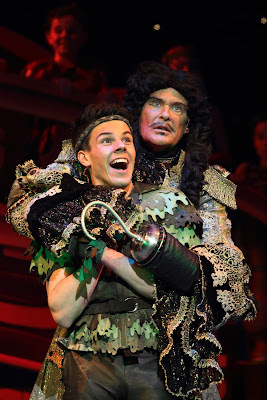 Of course a good Peter Pan is all about the star-billed talent playing the dastardly Captain Hook – and to be fair, they don’t come much bigger or more dastardly than David Hasselhoff. 'The Hoff', as he is known, has featured on the UK's pantomime scene for some years now and his involvement is remarkable. He certainly doesn’t need the money - and my word a panto season is hard work too - but for an American (former mega) star to immerse himself in this most quintessentially British of theatrical traditions, along with the self-deprecation that accompanies the part, is just brilliant. Baywatch (referenced by Doyle in a Pamela Anderson, bikini sporting, fat suit) and Knight Rider both get a mention and even if those shows' appeal is to the parents rather than kids in the crowd, Hasselhoff clearly revels in the boos - which briefly turn to cheers as along with Doyle he corpses his way through a tongue twisting routine about pleasant peasant pheasant pluckers. And as Hasselhoff is flown off stage (spoiler alert) to be fed to the crocodile, he sings My Way. The cheesy, guilty, ridiculous pleasure of the moment is quite simply off the scale! It's a Qdos Production, so as expected the flying, the scenery and the dance routines are all top notch. Veteran director Tudor Davies helms the affair with a profound understanding of both the material and his provincial audience. It all makes for fine fabulous family entertainment and if you’re in Cardiff over the festive season, it’s unmissable too! Wow, wish I could get to see it. Love anything with the Hoff. David is the most swoon worthy hook ever!